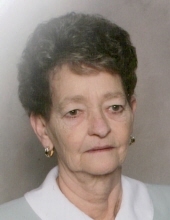 EVELYN LUCILLE “LUCY” MEADOWS, 76 years of age of Grundy, VA, passed away Monday, March 25, 2019 at the Johnston Memorial Hospital in Abingdon, VA, following a brief illness. Born in Grundy, VA, she was the daughter of the late Troy and Stella Dotson Thomas. She was a lifelong resident of Buchanan County and was a member of Guiding Light Freewill Baptist Church. Lucille dedicated her life to raising her family and was a loving mother, grandmother (nana), great-grandmother and friend. She will be missed so very much by all who knew her. In addition to her parents, she was preceded in death by her husband, Virgil Mays Meadows; her sister, Jean Little Wilson; her brother, Robert “Bob” Little; 2-Grandchildren: Bryce Tyler Dye and Emma Caroline Meadows. Also, survived by grandchildren, Andrew Meadows, Staci Dye, Isabella and Andrew Dye, Laekan (Duncan) Holzworth, Alexa Barnett, Amber, Abigail and Mariella Meadows and 1-Great-Grandchild: Briar Holzworth. Funeral Services for EVELYN LUCILLE “LUCY” MEADOWS will be conducted Friday, March 29, 2019 at 1:00 P.M. at the Grundy Funeral Home Chapel with Sonny Perkins and Philip Imel officiating with burial to follow in Clinch Valley Cemetery, Richlands, VA.
Friends may call at the Grundy Funeral Home Chapel Thursday evening at 6:00 P.M. Active Pallbearers will be William “Hody” Woodard, Raymond Imel, Jim Dotson, Claude Dye and Family and Friends. Grundy Funeral Home of Grundy, VA is honored to serve the family of EVELYN LUCILLE “LUCY” MEADOWS. To plant a tree in memory of Evelyn Lucille Meadows, please visit our Tribute Store. "Email Address" would like to share the life celebration of Evelyn Lucille Meadows. Click on the "link" to go to share a favorite memory or leave a condolence message for the family.